Another great way to use up extra zucchini! Adjust the spices if your family prefers things more mild or more spicy. These are a huge hit with my kids. Sift the chickpea flour into a medium bowl. Mix in the baking soda, salt and spices. Make a well in the center of the dry ingredients. Gradually pour the water into the well and mix to form a thick, smooth batter; it should be thicker than pancake batter. In a medium-sized heavy saucepan, heat the oil to 375 degrees F (190 degrees C). Squeeze extra moisture out of shredded zucchini by wrapping it in a paper towel and wringing. Add shredded vegetables and garlic to batter and stir to coat. Spoon into hot oil by the scant Tablespoonful and fry in small batches until golden brown, about 2 - 4 minutes, turning to brown both sides. Haha i thought they looked like battered prawns when i first looked at the photo too. Oh I love pakoras! Anything fried is my favorite thing. Thanks for the recipe. yum fried foodz! I wish i wasn't dieting! 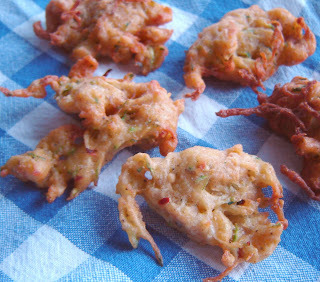 i love pakoras so much i've considered naming my daughter pakora when she gets here in december. i kid, i kid. seriously i love me some pakoras though. and thanks for the green tomato recipes. i've even dehydrated a few in my mega machine with pretty good results. i also have you to thank for that b/c of your awesome sun dried 'mater post. Ha! They do look like little fried crabs. If only we could trick omnis like this! Oh gosh, MUST try these delicious little morsels! Thanks for adding another zucchini recipe to my ever-growing repertoire!